Forget iPhone passcode, or iPhone is disabled? Joyoshare iPasscode Unlocker was officially launched to helps users remove iPhone/iPad/iPod touch lock screen easily. 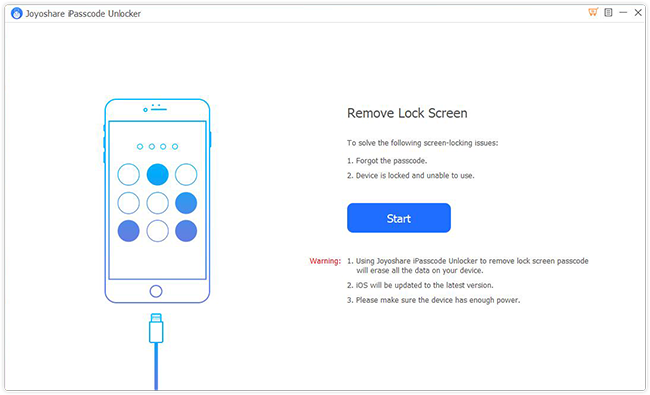 KOWLOON, China - Jan. 5, 2019 - PRLog -- Joyoshare Software has recently announces the release of its new iOS utility member named Joyoshare iPasscode Unlocker to remove screen lock on iPhone, iPad and iPod touch in mere minutes. As its name suggests, iPasscode Unlocker is specially designed to unlock iPhone passcode when users forgot password, got a second-hand iPhone with passcode, iPhone is disabled or cannot enter the password on a broken screen iPhone, etc. As one of competitive iOS passcode unlocking tools in the market, Joyoshare iPasscode Unlocker is capable of removing different types of passcode. Whether it is a simple 4-digit password, 6-digit password, or more complicated Touch ID and Face ID, Joyoshare iPasscode Unlocker could quickly crack the lock without a hitch. With a user-friendly interface and clear buttons, removing iPhone lock screen with iPasscode Unlocker can be completed in 3 easy steps only. Just connect your iOS device to the computer, download and verify firmware package and then start to unlock the iDevice screen passcode. Anyone can easily handle it within 5 minutes, no special technical skills needed. "There are always times when we need to unlock iPhone passcode, for example, your iPhone is disabled after entering the wrong passcode by your kids for many times, can't remember the password set long time ago, bought a second-hand iPhone with locked screen, etc. That's why we developed this intelligent iPhone passcode unlocker," said James, Joyoshare Product Manager. "Now people can use Joyoshare iPasscode Unlocker to unlock iPhone/iPad screen lock faster and easier without using iTunes," added he. One implicit feature of Joyoshare iPasscode Unlocker is that users can easily reset iPhone to factory settings without iTunes or passcode. Plus, it enables users to permanently erase iPhone/iPad data without password, which is of great help when you want to give away or sell your device to others. Joyoshare iPasscode Unlocker (https://www.joyoshare.com/ipasscode-unlocker-for-win/ ) free trial version and paid version are both available now on its official website. As for the paid version, is normally priced at $39.95 for a single license copy with lifetime free support and update. There are also other license types available, including $59.95 for up to 5 iDevices with lifetime free update and support, and $79.95 for multi-user license. Importantly, whichever license you have, you can use it on an unlimited number of computers. At present, Joyoshare iPasscode Unlocker is available for both Windows and Mac systems, including Windows 10, 8.1, 8, 7, Vista, XP and macOS 10.14, 10.13 High Sierra, 10.12 Sierra, 10.11, 10.10, 10.9 and 10.8. It is fully compatible with almost all iOS devices, including the latest iPhone XS (Max)/XR, all iPad and iPod touch models as well as all iOS versions, including the latest iOS 12. Joyoshare (https://www.joyoshare.com/ ) is a global software developing leader, first specialized in the video field for years and now it extends its product scope to iOS solutions. With advanced technologies and professional R&D team, Joyoshare is dedicated in developing the best video cutter, screen recorder, video converter, HEIC converter, iOS data recovery, iPhone passcode unlocker etc. to customers all around the world. With professional and high quality service, Joyoshare has won high reputation online from millions of registered users over the past years.